Comic book adaptations are the rage nowadays. And since they make big money in spite of being fairly crap, studios are releasing numerous movies to create the gigantic Marvel Cinematic Universe (MCU) so that they can make tons of money. They can then use this money to make even worse movies about superheroes being dumb. 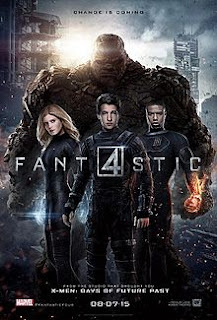 Fantastic Four is the latest such movie to be released in theatres in Mauritius. So how does this new Marvel product fare? At around 90 minutes, it's a fairly short movie by today's standards. This is an extremely important positive thing about Fantastic Four as you'll see later on during this review. For everybody's convenience and especially mine, I am going to make this into a list. There are so many bad ideas about this new adaptation of Fantastic Four, I'm surprised the studio went ahead with its release. 1. The Fantastic Four team is fairly young - probably to attract young audiences more easily. This may be a great marketing tactic but it changes everything about the story. When the Fantastic Four comic was first released, one of its main strengths was the fact that Reed Richards, the self-proclaimed leader of the team, was a middle-aged man. By turning Reed into a 18-year-old hipster teen, the movie is essentially ignoring the franchise's true fans. 2. The cast is bad. Really, really bad. The same can be said about many Marvel Movies but they at least had great actors who make the experience bearable such as James Spade as Ultron in the last Avengers movie, Robert Downing Jr. in any Avenger movie or Hugh Jackman in anything X-men but Fantastic Four lacks even top billing, which is crazy for a multi-million budget summer flick. Even Ant-man had Paul Rudd who, although not an A-lister, is well-known and has something of a cult following. 3. How hard is it to get Doctor Doom right? I was not a big Fantastic Four comic book reader but even I know that Doctor Doom is widely considered one of the best Marvel villains ever created as he is more of a "good ideas but bad implementation"-type antagonist. He's probably one of the biggest comic book icons ever created. However, the Doctor Doom in this movie does not even have a motive for his actions (ie, the usual destruction of the world) and has no charisma. Also, he's not even called Doctor Doom, but just Doom as he proclaims himself during the movie. Reed Richards and Ben Grimm (Thing) are hired during a school exposition to build upon their idea of a transporter. I'm sure I would also trail colleges looking for my next employees if I was in charge of critical research costing billions of dollars. Johnny Storm (Human Torch) cannot even build his car to not explode but is forced by his father to join the team because "he can build things". When Reed is reunited with his friends after they get their powers, he never once apologizes to them for the accident and acts as if he's in charge. Even worse, other than Ben, the others do not have anything to say about his arrogance and merely follow his lead. Ben just accepts the changes to his body pretty quickly - there is nothing of the anguish seen in the previous Fantastic Four movie. During the final fight (also known as the only fight), Doom miraculously knows that Sue Storm can turn herself invisible although he's never seen her display these powers. One of the "best" scenes from the trailer, where the Things drop from a plane is not even included in the final cut. Talk about a case of false advertising. 5. There is no character development at all in Fantastic Four. We are supposed to relate to characters we know absolutely nothing about other than the facts that one is a genius (Reed), one gets clobbered by his older brother (Thing), one is adopted and "understands patterns" (Sue), and one can build things (Johnny). At various points throughout the movie, some scenes point to character development at later stages but these never happen (just like the trailer scene mentioned above). 6. The movie tries to adopt a serious tone, probably in response to the criticisms of other Marvel movies but this never truly works. This is due to a number of reasons including the bad pacing, the poor quality of the screenplay, and the lack of character development. In the Marvel universe, the Netflix show Daredevil is the only one that successfully pulled this off and is absolutely incredible. If you hate series and are looking for a more serious comic book movie, look no further that Nolan's critically acclaimed Batman trilogy. 7. The Fantastic Four feels like two movies. The first half is bad but still watchable as long as you don't go in expecting Interstellar-level direction (one of my next reviews - shameless plug). However, once they get their powers, everything feels rushed and the movie degenerates into a mindless cheesy action trailer. It's almost as if another director took over at that point and did not care about the project. Apparently, there's going to be a sequel.